Wholesale Manual ink cup pad printer,manual ink cup pad printing machine,manual ink cup tampo pad print equipment. The machine is light and sturdy with a heavy-duty, high-quality aluminum alloy frame. The pad holder and work table can both be adjusted up and down, forward and backward. Like an Auto. Convenient ink cup installation, cleaning, and ink loading. The ink cup has a screw knob that can be removed to feed additional ink or thinner into the cup during operation, like a Auto. 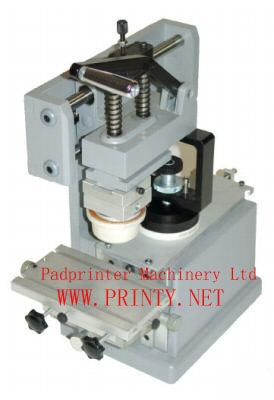 Manual ink cup pad printing machine china manufacturer. Wholesale manual ink cup pad printers,manual ink cup pad printing machine,manual ink cup tampo pad printer,manual ink cup pad printing equipment.